If you would like to have special access to our free resources – like our eight Corporate Family™ leadership White Papers, The LEADing Blog, our LEADon brochure, and our monthly Leadership emails – please complete the contact information below. You will receive a confirmation email upon completion of this contact information which will give you direct access to these free LEADon resources. All information you provide will be confidential and used only by our LEADon team. Remember, you can unsubscribe at any time. Thanks for taking time to connect with us today! Does Developing Emotional Competency in Your Corporate Family® Really Improve Productivity and Profitability? Can EQ and RQ Yield Quantitative Results in the Workplace? Does Corporate Culture Really Impact the Bottom Line? 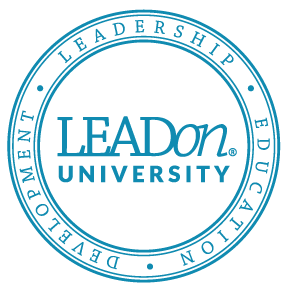 Discover how a LEADon University membership can transform your personal and professional life. Barna, G. (Ed.). (1997). Leaders on Leadership. Ventura, CA: Regal Books. Bennis, W. (1989). Why Leaders Cant Lead. San Francisco: Jossey-Bass. Blackaby, H., & Blackaby, R. (2001). Spiritual Leadership. Nashville: Broadman & Holman Publishers. Blanchard, K. & Lorber, R. (2006). Putting the One Minute Manager to Work: How to Turn the 3 Secrets into Skills. New York: William Morrow and Company, Inc.
Blanchard, K., McKay, H., & Bowles, S. (1993). Raving Fans: A Revolutionary Approach to Customer Service. New York: William Morrow and Company, Inc.
Blanchard, K., Zigami, D., & Zigami, P. (1985). Leadership and the One Minute Manager.New York: William Morrow and Company, Inc.
Brookhiser, R. (2008). George Washington on Leadership. New York: Basic Books. Champy, J. (1995). Reengineering Management: The Mandate for New Leadership. New York: Harper Business. Collins, J. C., & Porras, J.I. (1997). Built to Last: Successful Habits of Visionary Companies. New York: HarperBusiness. Collins, J. (2001). Good to Great: Why Some Companies Make the Leap and Others Don’t.New York: Harper Business. Crocker, H. W. (1999). Robert E. Lee on Leadership: Executive Lessons in Character, Courage, and Vision. Rocklin, CA: Forum. Crowley, K., & Elster, K. (2006). Working with You is Killing Me: Freeing Yourself from Emotional Traps at Work. New York: Business Plus. Depree, M. (1989). Leadership Is an Art. New York: Dell Publishing. Depress, M. (1992).Leadership Jazz. New York: Dell Publishing. Drucker, P.F. (1996). The Executives in Action. New York: HarperBusiness. Garfield, C. (1987). Peak Performers: The New Heroes of American Business. New York: William Morrow and Company, Inc.
Greenleaf, R. (1983). Servant Leadership: A Journey into the Nature of Legitimate Power and Greatness. New Jersey: Paulist Press. Goleman, D. (1997). Emotional Intelligence. New York: Bantam Books. Goleman, D., Boyatzis, R. & McKee, A. (2002). Primal Leadership: Realizing the Power Of Emotional Intellignece. Boston: Harvard Business School Press. Hamilton, J. R. (1973). Alexander the Great. Pittsburgh: University of Pittsburgh Press. Hasselbein, F., Goldsmith, M., & Beckard, R. (Eds.). (1996). The Leader of the Future.San Francisco: Jossey-Bass. Haughton, L. (2004). It’s Not What You Say . . . It’s What You Do: How Following Through At Every Level Can Make or Break Your Company. New York: Currency/Doubleday. Hayward, S.F. (1997). Churchill on Leadership: Executive Success in the Face of Adversity. Rocklin, CA. : Forum. Iacocca, L., & Novak, W. (1984). Iacocca: An Autobiography. Toronto: Bantam Books. Jenson, R. (2001). Achieving Authentic Success. San Diego: Future Achievement International. Kouzes, J.M., & Posner, B.Z. (1999). Encouraging the Heart: A Leader’s Guide to Rewarding and Recognizing Others. San Francisco: Jossey-Bass. Kouzes, J.M., & Posner, B.Z. (2008). The Leadership Challenge, (4th ed.). San Francisco: Jossey-Bass. Kytle, C. (1969). Ghandi: Soldier of Nonviolence. Washington, D.C.: Seven Locks Press. Lardner, J. (1999). World-class Workaholics. U.S. News & World Report. (December 20, 1999). Lencioni, P. (2000). The Four Obsessions of an Extraordinary Executive. San Francisco: Jossey-Bass. Manchester, W. (1983). Winston Spencer Churchill: The Last Lion, Visions of Glory, 1874- 1932. New York: Dell Publishing. Markham, F. (1963). Napoleon. New York: New American Library. McCullough, D. (1992). Truman. New York: Touchstone. Murray, I.H. (1987). Jonathan Edwards: A New Biography. Edinburgh: Banner of Truth Trust. Reagan, R. (1990). Ronald Reagan: An American Life. New York: Pocket Books. Senge, P.M. (1994). The Fifth Discipline: The Art and Practice of the Learning Organization. New York: Currency/Doubleday. Schwarzkopf, H.N., & Petre, P. (1992). It Doesn’t Take a Hero. New York: Bantam Books. Sullivan, G.R., & Harper, M.V. (1996). Hope is Not a Method: What Business Leaders Can Learn from America’s Army. New York: Broadway Books. Swenson, R.A. (1992). Margin: Restoring Emotional, Physical, Financial, and Time Reserves to Overloaded Lives. Colorado Springs: Navpress. Thatcher, M. (1993). Margaret Thatcher: The Downing Street Years. New York: HarperCollins. Wilke, S., & Wilke, R. (2010). The Leading Edge: 9 Strategies for Improving Internal and Intentional Leadership. San Diego: LEADon, Inc.
Wilke, S., & Wilke, R. (2010). Corporate Family Matters: Creating & Developing Organizational Dynasties. San Diego: LEADon, Inc.